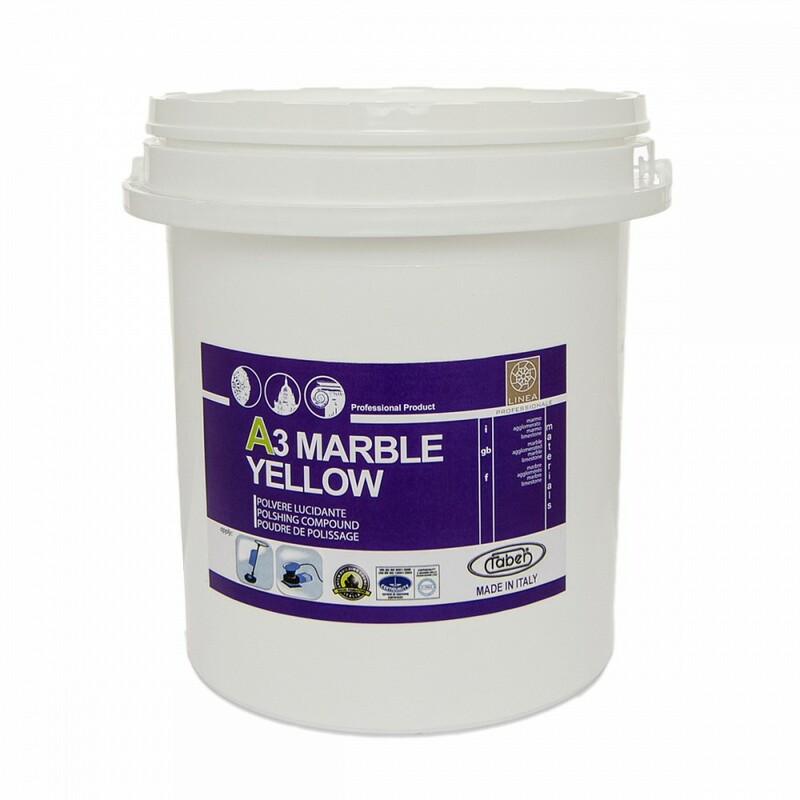 A3 YELLOW is a high-performance wet polishing powder for all types of marble and lime-based materials in general, such as limestone, travertine, marble-cement agglomerates and marble-resin agglomerates. Its formulation offers excellent results when it comes to the clarity and depth of shine on the finished surface. A3 YELLOW does not contain wax but it reacts with the material it is applied to, boosting shine and at the same time, leaving the surface with a lasting resistance to dirt and pedestrian traffic. A3 YELLOW is also able to boost non-slip qualities on dry flooring. A3 YELLOW, like all polishing powders by Faber, will maximise the effect of the polishing process, making the whole operation much simpler by effectively replacing the time-consuming final steps in the mechanical polishing process. This means it is possible for the operator not to have to use end-stage polishing grains, which drastically cuts the time, energy, effort and the amount of water needed to complete the polishing process. Faber polishing powders can be used successfully both as an alternative to the finishing process of traditional mechanical polishing, and also to restore the shine on worn surfaces in case it is not possible to intervene directly with a mechanical polisher. They can also be used to maintain surface shine on a regular basis.